Magick from India! Magick from ancient Egypt! Magick from Rome! 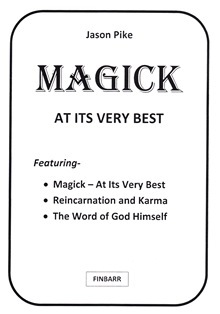 Magick at 'its very best' means just that. My book brings you the magick that has worked time and again for me personally and my friends. This is powerful, simple and above all, EFFECTIVE magick. Magick from the temples of ancient Egypt... from the yogi masters of India... from the priests of Ancient Rome. Most of the magick instructions in my book has never before been published. It is genuine, ancient magick from the worlds most sacred magickal centres. I have written only what has worked and what has been proven and verified. As certain as I have written this book is my adherence to the highest principles of truth and honesty. I stand condemned before the one God I believe in if I say or write anything which I know to be untrue. A man wrote to me saying he was dis-illusioned with magick and the occult. He had tried so many rituals, read so many books, and still was no further than when he started. He had become thoroughly cynical. I couldn't blame him but I urged him - just once more - to try magick, at its very best, known to me but unpublished. He followed my instructions and two weeks later he wrote back to say he had won $60,000. But this was not an isolated piece of unexplained good luck. He continued practising my magick and continued to win large amounts of money. This was two years ago. Today he says he lives 'like a king', to use his exact words. My neighbour's family was suffering on account of his gambling debts. He had become desperate. I told him magick could solve his problems and told him what to do. Ironically the weakness which got him into this trouble was the same one that got him out of it. He placed a bet on a complete outsider which won - and he suddenly had $10,000 in his hands. Now I do not advocate gambling as a sensible way of solving financial problems but you will see how in my book magick can work in the most mysterious and unexpected ways. WHAT I AM TELLING YOU ACTUALLY HAPPENED. IT IS TRUE. My book is packed with more, real, workable instructions than a thousand other so-called 'magick' books. My book shows you how to awaken those powers that make seeming 'miracles' happen. Other books say you must study for years or perform goodness-knows how many different, complicated rituals. With my book YOU NEED NO EXPERIENCE: I show you how to practise magick beginning straight away. With magick at its very best you can solve difficult problems within weeks. You can improve your luck in every direction. You can improve your health and become more loved and be blessed. This magick is absolutely safe. I don't dabble in the Black Arts. I am a Christian occultist who believes in the redemptory power of Jesus. I eschew all wrong-doing and falsehood. But you don't have to be a Christian to practise this magick. Magick is much older than Christianity. What really matters is your desire to succeed and the purity of your intentions. You can possess everything under God's Heaven by practising this ancient magick. My mother asked me if this magick could help her. She had never really shared my views but ten years of terrible dropsy made her ready to try anything. her situation was desperate. Her limbs were grotesquely swollen - even her poor head. medicine hadn't helped. She was in absolute misery. I showed her what to do. It was simplicity itself. IT WASN'T SPIRITUAL OR FAITH HEALING AND IT WASN'T VISUALISATION. Within two weeks the swelling was much less. AFTER TWO MONTHS THE DROPSY HAD COMPLETELY GONE. She was cured. That was two years ago. I swear before The Eternal that this is true. In my book you will find the very same, precise, instructions that cured my mother (the swelling symptoms never reappeared). I USED THEM TO CURE MY ASTHMA. These simple instructions are MAGICKAL. True magick WORKS - otherwise it's not magick but nonsense. MY BOOK REVEALS MORE THAN YOU CAN IMAGINE. IT GIVES YOU MUCH MORE THAN JUST SOLVINGEVERYDAY PROBLEMS. IT SHOWS HOW TO GAIN EXTRAORDINARY SPIRITUAL AND PSYCHIC POWER. You can move objects - by the power of thought alone. You can see through closed doors and walls. You can gain entry into the astral dimensions. You can discover the very real world that exists beyond time, space and matter. You can see events before they happen, and learn the hidden secrets of the past. Find out who you were in your past life and discover the meaning of your present karma. Health and money is important, nut love is perhaps more important. A man wrote to me desperate and lonely. The occult hadn't helped him find true love. He wanted this more than anything. A woman had entered his life within one week. He knew she was the one - his true soul mate. That was three years ago. They are now married and have started a family. Once you have got my book you can write to me. Finbarr faithfully passes every letter to me. I will answer you - and it won't cost you a penny. I am here to help people to fulfill God's Will. My book can transform your life. I know it.